Photoshop Elements 11 offers several methods to share your creations via third-party services. In the Share panel, you find several supported services for displaying and sharing photos. Adobe Photoshop Showcase: Elements supports a great companion product — Adobe Premiere Elements. Premiere Elements is a tool for editing videos. To use the Online Video Sharing feature, you need Premiere Elements. You can download Premiere Elements free from the Adobe website for a 30-day trial period. You can use Premiere Elements and all its features during the trial. If Premiere Elements interests you, you can purchase the product online after the 30-day trial. To download your trial copy, simply click the Sharing Video with Adobe Photoshop Showcase button and follow the instructions to proceed to the download area. Note that other options in the Share panel, such as Burning a Video DVD/Blue Ray and Mobile Photos and Players, also require Adobe Premiere Elements. Flickr: Flickr is a popular photo-sharing service offered free from Yahoo!. You follow the same steps as other sharing services. Select photos in the Organizer and open the Share panel. Click the Share to Flickr button in the Sharing panel. 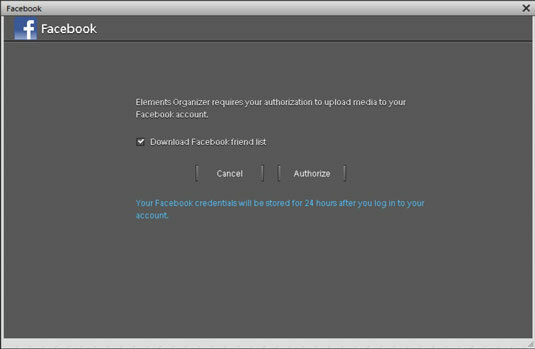 A dialog box opens prompting you to authorize your account. Click the Authorize button, and your default web browser opens and takes you to your Flickr site. Facebook: Direct links to Flickr and Facebook have been promoted in Elements 11 to the top level in the Share panel. As with Flickr, you can select photos you want to upload to Facebook and click the Share to Facebook button in the Share panel. The same authorize dialog box opens as shown. Click Authorize, and you’re prompted for your logon information. When you log on, you arrive at your Facebook account. SmugMug Gallery: Select photos in the Organizer and choose the Send Photos to SmugMug Gallery menu item. The service offers attractive album-creation options for your photos that you can print or share online. Adobe Revel. Adobe Revel is available on the Macintosh only. Revel is a paid subscription service for hosting photos and videos. With all the free web hosting opportunities you have available, you may not be inclined to pay for a subscription service. You have a limited free trial period before you need to set up an account. Check it out and see whether Revel meets some of your sharing needs.